The B:LINK network augments the existing wirelessly shared timecode and sync data. The proprietary B:LINK RF network keeps the same incredibly accurate wireless sync over the robust sub GHz ISM bands, but adds enhanced two-way multiplexed status/control and metadata. This allows for complete monitoring and control of all connected “B:LINK-enabled” Timecode Systems’ devices and is built to allow for long-range remote control and status of any supported & connected third-party accessories. 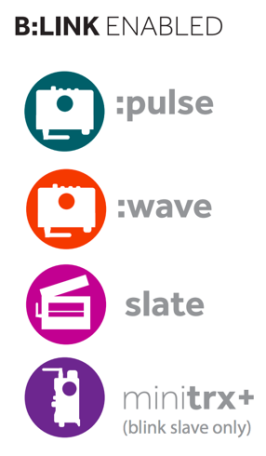 A product such as the pulse, wave or Denecke TS-TCB slate can be configured as a BLINK master, and products such as the pulse, wave, trx+ and Denecke TS-TCB slate can be configured as BLINK slave devices. Your mini trx+ will automatically function as a B:LINK slate device when in RF/C mode and receiving a timecode signal from a B:LINK master unit (needs to be set to the same RF channel and country). The B:LINK slave devices are continually feeding back their status and settings to the B:LINK master unit. 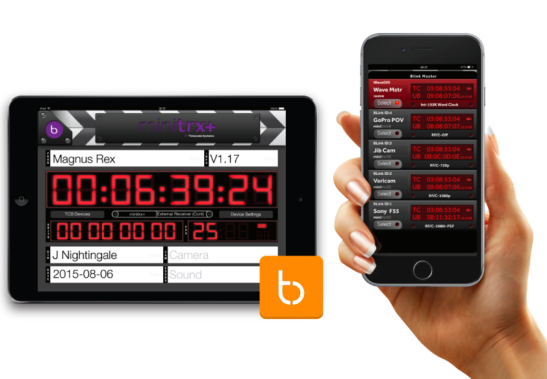 The BLINK master unit then allows apps such as MovieSlate 8 and the Timecode Buddy: app; to not only display all of this information, but allow the user to remote control certain features. Additionally with the wave and pulse products, if any supported 3rd party equipment is connected the Data port or Ethernet port (pulse), then this equipment can also be remotely controlled. Of course, all of this B:LINK functionality is multiplexed with the original Timecode and Sync information data packets. This ensures that legacy and non- B:LINK Timecode Systems’ devices are still supported from a B:LINK master source. The huge advantage of the BLINK protocol is that the Timecode Systems RF transceiver is very long range and robust, with up to 500 metres line of sight range. It is a very uncongested frequency band on set and in heavy RF environments. This then allows the Wi-Fi network of the B:LINK master to be used as a short wireless hop into the apps or a solid cabled Ethernet connection between the PC or Mac, with the long range communications to slave units being looked after by the B:LINK network. If you own a B:LINK enabled Timecode Systems WiFi product (pulse, wave and Denecke TS-TCB Slate) then you will be able to monitor and control the mini trx+ from the Timecode Buddy: app. Simply use the WiFi product in a MASTER TX mode, use the mini trx+ in RF/C slave mode. Ensure all devices are on the same RF channel. Once you log your iPad/iPhone onto the WiFi network you will see the mini trx+ device when you press the TCB Devices tab on the app. If you want to remotely change any of the Device settings via the app, press settings, type in the four-digit passcode (set on the systems menu of your B:LINK master WiFi Device) then make changes directly from the app. Overview. 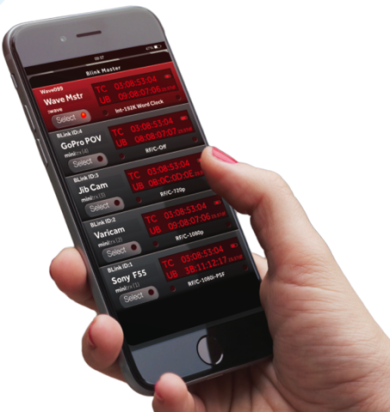 The app allows you to display a frame accurate Timecode Reader of your timecode on-set, via the WiFi network. It also allows some remote settings of the trx+ unit itself when connected BLINK master WiFi unit. Clicking on TCB Devices shows all Timecode Systems units available and allows you to select one to connect to and control. Clicking on Device Settings causes a passcode prompt to appear. Ensuring that only users with the passcode permission can change the device settings. From this menu you have the option of choosing direct remote control.